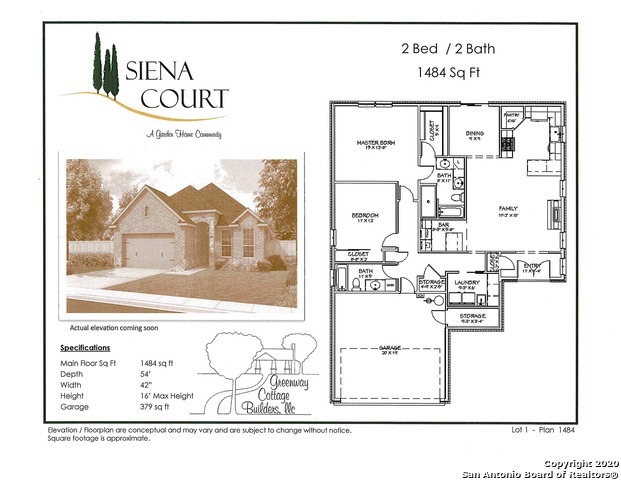 All SIENA COURT GARDEN HOMES homes currently listed for sale in Boerne as of 04/18/2019 are shown below. You can change the search criteria at any time by pressing the 'Change Search' button below. "Boerne's Exclusive Gated Garden Community. 25 TOTAL HOMES TO BE BUILT. NO MODEL. 20 FLOOR PLANS FROM 1204 SQ. FT. AT $319,000 TO 1887 SQ. FT. AT $469,000. 2/2 AND 3/2 PLANS. MOST PLANS FIT ON MOST LOTS. LOOK AT HIGHLIGHTED SECTION AT BOTTOM OF EACH PLAN TO SEE THE LOT THEY FIT. AVERAGE LOT SIZE 45'X120'. SINGLE STORY, ATTACHED GARAGES, GATED, TANKLESS HW HEATER, BOSCH APPLIANCES, MICHAEL EDWARDS CUSTOM CABINETRY,GRANITE, CLAY TILE ROOFS, ROOMS SIZES ARE FOR PLAN 1204. TAXES/HOA TO BE D"